Is It Good? Bloodshot Reborn #12 Review – AiPT! It’s the future and Bloodshot just wants to find some peace. Unfortunately some bad guys carrying goo-tech didn’t respect his wishes and blew his town to high heaven. Now Bloodshot’s teaming up with Ninjak and plans to end those who ended his dream of retirement — whether it kills him or not. Most likely not given his powers, but is it good? This has been one hell of a ride with Old Man Logan vibes throughout. 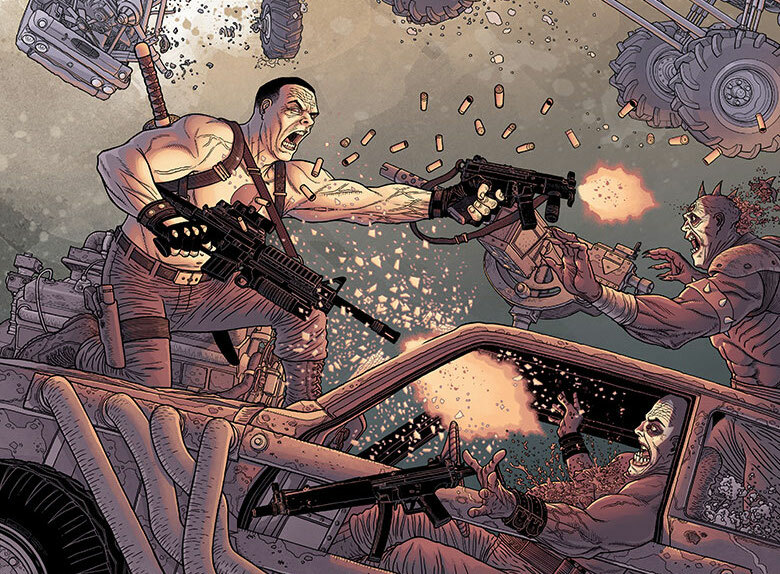 Bloodshot is older, wiser, and much more willing to do what it takes to kill or be killed. The art by Lewis Larosa has been spectacular too in a painterly style that’s lifelike and highly dramatic. There’s also a highly compelling science fiction future world on display that writer Jeff Lemire has laid out well. And the rest of the issue is badass action! Once again we see the war rigs from earlier issues that look similar to something out of Mad Max, but with the added bonus of goo-tech weaponry. Ninjak and Bloodshot must fight their way through Shadowman’s gang and eventually a battle with Shadowman himself. We get some awesome action with a lot of stabbing, explosions and gore too. Larosa does not disappoint in this issue with two phenomenal double page spreads that will make your jaw drop. In one Bloodshot is flipping backwards from a jet refusing to use a parachute and in another he’s slicing and dicing his way through bad guys. He and Ninjak always look great as they cut through the villains, but the creme de la creme is the Shadowman fight sequence that’s simply brutal. Bloodshot takes a hit on purpose to bring the fight close and as it progresses the panels get tighter on the characters as they bludgeon each other. The layouts are brutal and – mixed with some choice flashback panels – show us all the rage in Bloodshot boil over. Not to be nitpicky but there is one full page spread that wasn’t my cup of tea. It’s a closeup of a head getting stomped in and while it’s a good idea to really shock the reader it doesn’t look as detailed or as finished as the rest which took me out of the book. It’s a minor blip in a solid story from beginning to end. Aside from that quibble it seems oddly easy for Ninjak and Bloodshot to cut through their enemies. In an earlier issue Lemire made it seem like goo-tech was a major weapon our heroes should be afraid of, but in this issue it’s way too easy for them to defeat their enemies. This limits the stakes and makes the victory seem all to easy at this juncture. With a good balance of flashbacks to remind us of why Bloodshot wants revenge this issue works well to deliver major action with emotional resonance. This might go down as one of the most epic action comics you’ve ever seen.